Oh, and did I mention half the ceilings in the house have semigloss paint? The glare drives me to distraction. None of them are quite right so I carted home a bunch more paint sample cards and taped them up. 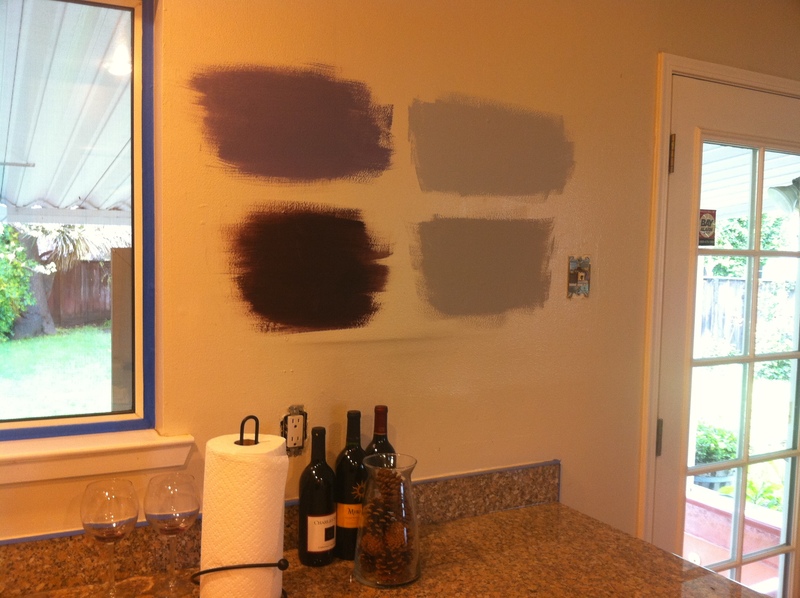 We’ve narrowed it down a lot, but I’m pretty sick of comparing “slightly purplish white” with “slightly bluish white” and “different slightly bluish white”, so I’m just going to leave them up while I finish prepping and then make a snap decision and have NO REGRETS!!! Apologies for not bothering to white balance the pictures. I realize in this instance a bit of white balancing might have actually been helpful since we’re dealing with many shades of not-quite-white, but I just can not be inspired to spend much time spiffing up a bunch of pictures of my ceilings. 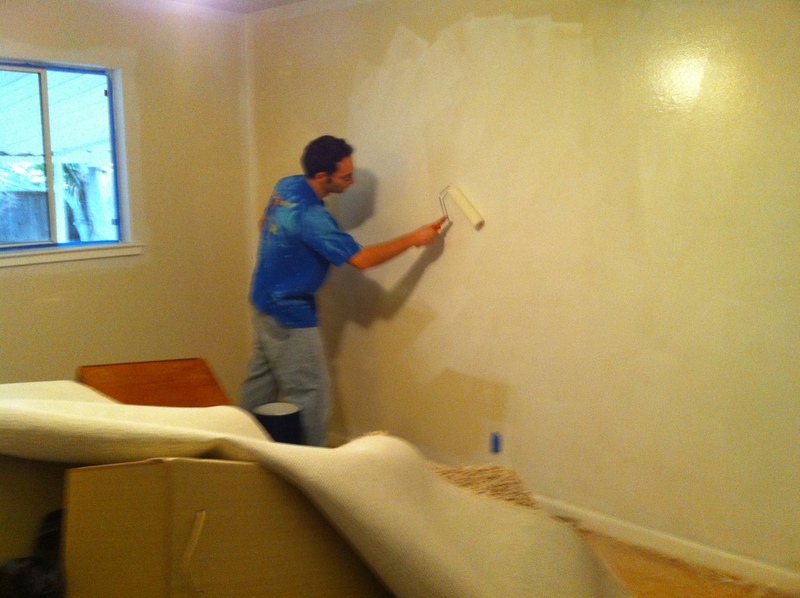 Yes, we’re FINALLY painting the master bedroom. We probably should be cleaning up the rest of the house and unpacking the many, many boxes that remain, but I just can’t handle the beige anymore. Unfortunately it doesn’t look like we’ll finish today, seeing as how it’s 6pm and we aren’t done priming yet. 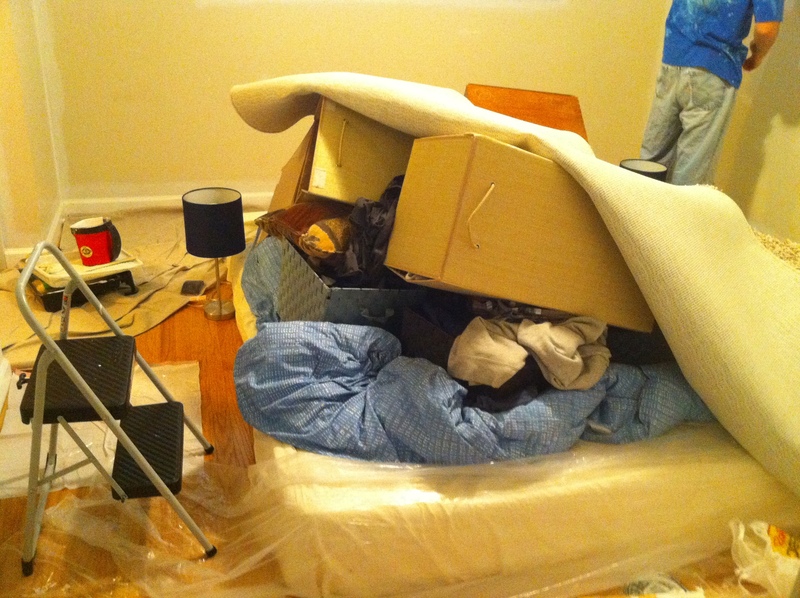 It was a big hassle to pile everything in the middle of the room, too. Ah well, at least the walls won’t be beige any more. I think we found the color we were looking for, finally. It’s the one on the lower right in that picture. It’s hard to tell on my iPhone, but it’s a purplish grey. The picture below shows the color a bit better I hope, plus it shows the green wall to the right that it needs to not clash with. 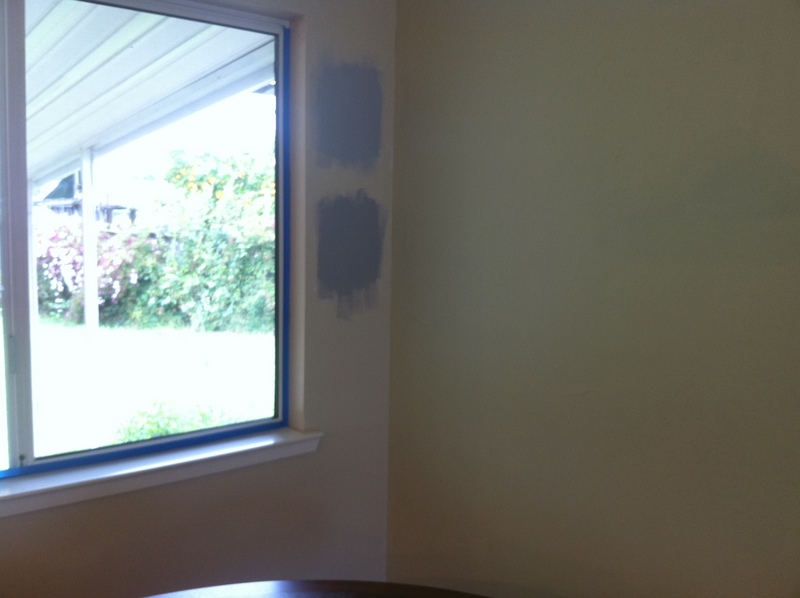 We’ll be tackling the master bedroom walls first, since we already bought the paint we need. But soon, kitchen. Very soon.